vacuum casting, also called polyurethane casting, it is a good method to satisfy your low volume production needs at a low cost, you can have 10 or several hundred custom parts in a short time, it is critical part of Prototyping China processes. There are several steps for the vacuum casting process. 1. Make a master part by CNC machining or 3D printing, post finish is necessary if the casting part needed in gloss or texture. 2. 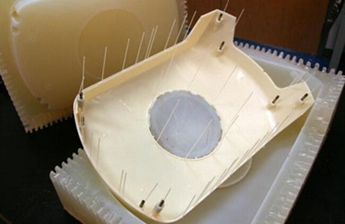 Create a silicone mold. a: Make up the silicone according to the instruction, then discharging the moisture content under vacuum condition. b: Make a custom box, the size of that box should be 20mm bigger than the master part. c: Fix the master part into the box, then pour the prepared silicone into the box. Discharge the moisture again under vacuum condition. d: It takes 1 to 4 hours to cure the silicone under 60~70 degrees Celsius in the oven. Then we split the mold by knife and take out the master part, the finish on master will be transferred onto cavity. Mold life time ranges from 10 to 20 shots varies base on the part geometry and casting material. casting material Type: ABS-liked, PP-liked, PA-liked, PMMA-liked, etc, Rubber（40~90 shores）. part cured time: 30~60 mins depend on the part size and casting material & conditions. casting wall thickness: minimum at 0.5mm, 1.5mm to 5mm is good for casting. maximum casting size: 2000mm x 1200mm x 1000mm. If you are interested in vacuum casting, contact us to learn more about. When Should I Consider Low Volume Injection Molding? When Should I Choose Low Volume Manufacturing? How to Control Porosity in Pressure Die Casting?